A Mitt Romney campaign volunteer just got a high-profile pat on the back. 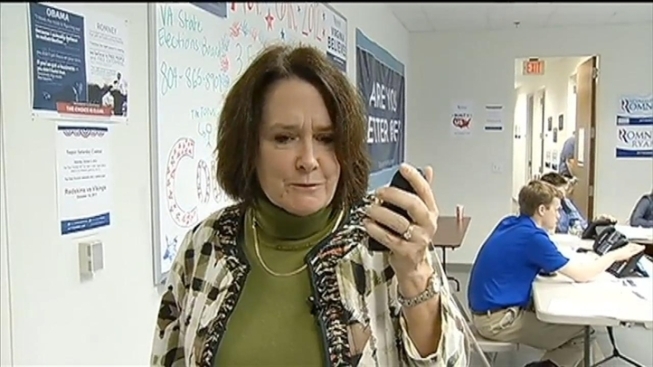 Meg Desmedt, who does about eight hours of phone banking a week in the Bristow office, got a personal shout out from GOP vice presidential candidate Paul Ryan. Desmedt had driven to the Arlington office to be recognized for making the campaign's 3.5 millionth voter contact in the commonwealth. As she waited for a news conference to begin, her cell phone rang. With the speakerphone on, News4 eavesdropped as Ryan told her he was calling from a bus traveling across Iowa. "I just heard you made the three-and-a-half millionth voter contact call in Virginia and I want to thank you for busting it, crushing it and doing such a great job," Ryan said to the volunteer. "We really appreciate it. It makes a huge difference." Ryan then noticed the "703" area code. "So you're northern Virginia. Where are you?" he asked. Desmedt explained she was from Nokesville near Manassas, where Ryan appeared with Mitt Romney the day the GOP presidential candidate announced his VP selection. "I remember," said Ryan. "That was the first day."